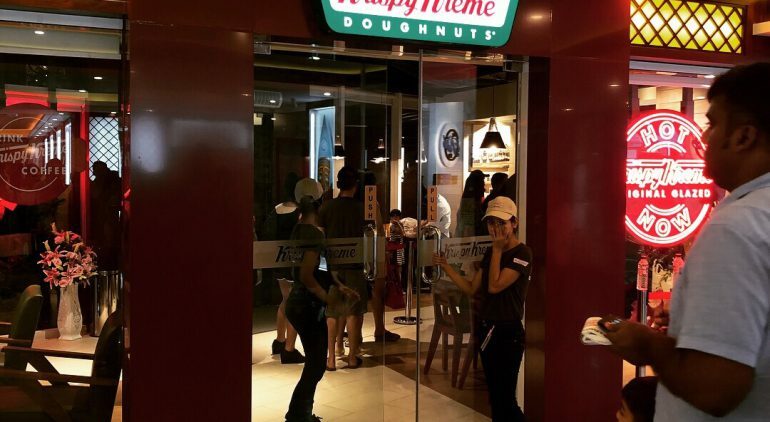 Krispy Kream Myanmar@Times Link was opened at the ground floor of Times Link Mall on 16th Sep 2018. Krispy Kream Myanmar have had any promotion to loanch their doughnuts at several hot spot shopping malls in yangon and they acquired a good reputation was opened. Their shop is the ground floor of Times Link Mall located at the corner of Dhammazedi road and Link road. That Mall is nearby central of Yangon city and located at the area where many rich people are living. We can really feel much expectation of Burmese people. The food textures of doughnuts sold in Myanmar are a bit hard like a bread but the ones of Krispy Kream are like fluffy.So we are looking forward to seeing if the taste of them will be changed to match for Burmese taste or not.Besides they plans to open some shops more in a few years in Myanmar. Anyway there is line of many people waiting to buy and it seems to be fine about the reputation of that tastes. Recently few shops of foreign famous franchise brand advance to Myanmar, we can feel vitality here by new coming this kind of famous brand from overseas. Propre has staff based locally and in Yangon, the central city of Myanmar. We share Myanmar lifestyle related information received from our local staff. We hope to share unique news about Myanmar which can not be obtained from the general news.